Receptacle's Branch Circuit is fed from [panel of circuit origin]. Outlet Box, to the Sub panel. Electrical Connection to the Sub panel's Metallic Enclosure. Transformer of a Separately Derived System], to the IG Bus. System's Grounded Conductor bond to the Grounding Electrode System. Detail #2a below is an overview. In this detail, the IG "Feeder" is run in the Sub feed Conduit to the Main Service. anything "Stupid" to the IG feeder bond conductor. from the IG bus in the Sub panel to the Main Service could be a #12 cu. Most Designs would specify the use of at least a #8 cu IG feeder bond conductor. I have normally installed and specified a #6 cu minimum for IG feeder bond. This Image was submitted to me by Joe Tedesco. Thank you very much for the Image, Joe! 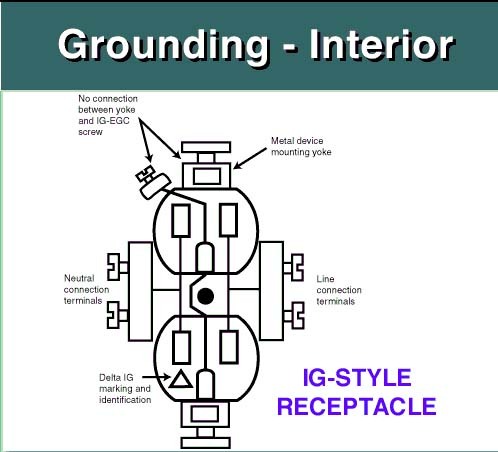 This Image shows the details of an Isolated Grounding [IG] type 15 Amp, 125 Volt 2 pole 3 wire Receptacle [NEMA 5-15R] - the most commonly used IG Receptacles. There are - of course - 20 Amp, 125 Volt 2 pole 3 wire IG Receptacles [I usually prefer to use the 20 amp recepts on high load / use equipment - such as Server Equipment, or where cords will be frequently unplugged / replugged]. Along with 5-15R and 5-20R type IG Receptacles, there are 15 and 20 Amp 250 Volt 2 pole 3 wire and 3 pole 4 wire [125/250 Volt] - which range upto 30 Amps. Discussion for these items located in the General Discussion area.